Keep your furry friends close when you stay at our pet-friendly hotel in downtown Portland! Guests will enjoy pet-friendly guest rooms complete with a special pet welcome kit. 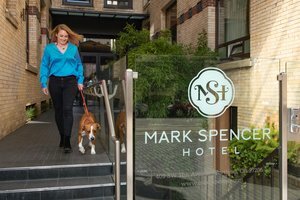 The whole family, dogs included, are sure to enjoy their stay with us at Mark Spencer Hotel! 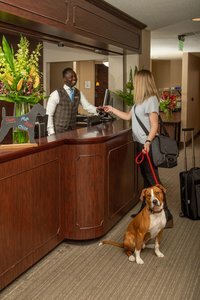 Before checking into the hotel, make sure to let us know that you will require a pet-friendly room so we can arrange special accommodations for yourself and your pet, as well as assemble your pet package! All pets must be registered at the hotel, and guests are required to pay a pet fee of $25 per day. We have specific pet-friendly floors, making it a more comfortable stay for all of our guests! A pet magazine with information on local parks, emergency services contact details, and more! We ask that you do not leave your pet unattended while you are away from the hotel. Charges may apply if an unattended pet creates a disturbance for other guests. Please keep your pet properly leashed when strolling through the hotel’s common areas. All pets staying with us require registration at the hotel, and will be charged a daily pet fee. Accidents happen! Please let us know if your pet has caused any damage to your room immediately. Damage charges may apply. As always, please clean up after your pet. Please ensure your pet is confined to a cage or kennel when staff enters the room for cleaning or maintenance. A weekly pet fee allows us to sanitize your room for future guests. Your welcome pet package contains all the information you may need on walking routes, pet service providers, and emergency veterinary care, but if you have any additional questions please feel free to reach out to a member of our front desk staff. 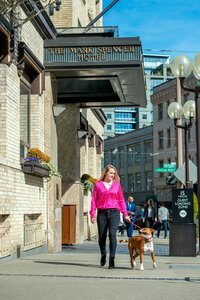 Book your stay at our pet-friendly hotel in downtown Portland today!